We include encouraging words from Thich Nhat Hanh, Pope Francis, First Nations, and American Indian Tribes. 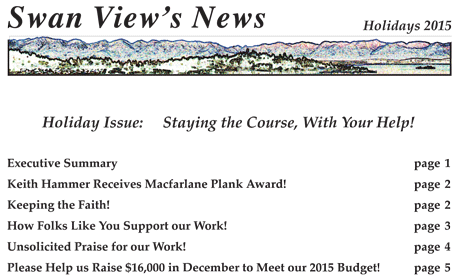 We report on Keith Hammer receiving the prestigious Macfarlane Plank Award from Friends of the Clearwater, thank you for meeting Cinnabar's Challenge Grant with your donations, and ask for your help raising $16,000 in December to meet our year-end budget! We hope you enjoy the newsletter and will continue to support our work!